Not from wikipedia as they did not have the information I wanted.
" The dictionary definition of reticular is "In the form of a network" and the reticulated is "having veins, fibers or lines crossing like a network, as in a leaf". These definitions accurately describe the appearance of metal after a particular type of heat treatment has been applied, a process that is known as reticulation. " So the short version goes like this.... you anneal and pickle your sterling silver sheet metal several times to bring a layer of fine silver to the surface then you do it once again but this time you keep heating carefully until you see the surface metal starting to move, this happens because the fine silver and the sterling silver have different melting point, you then continue heating trying hard not to melt the piece until you get the effect you want. 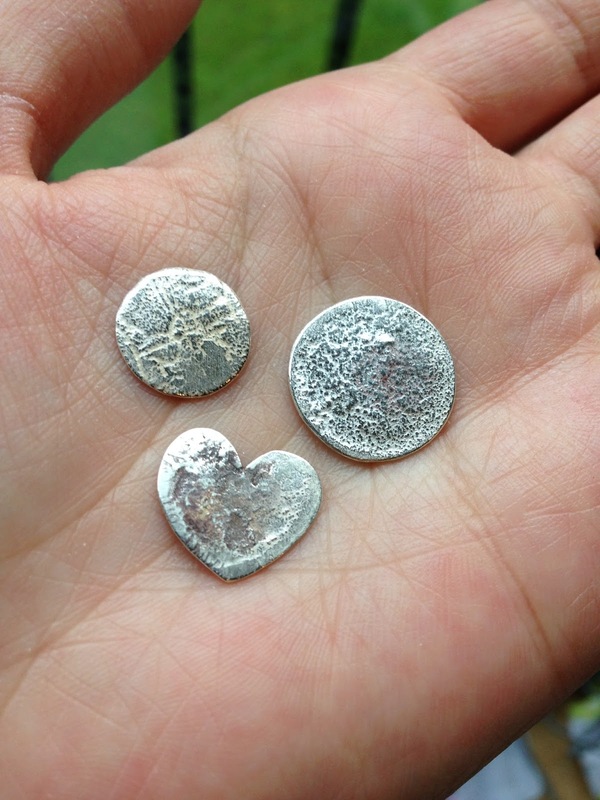 The heart still needs to be pickled but I can see these as cute little old looking charms maybe with a little something set on them, ancient treasures!